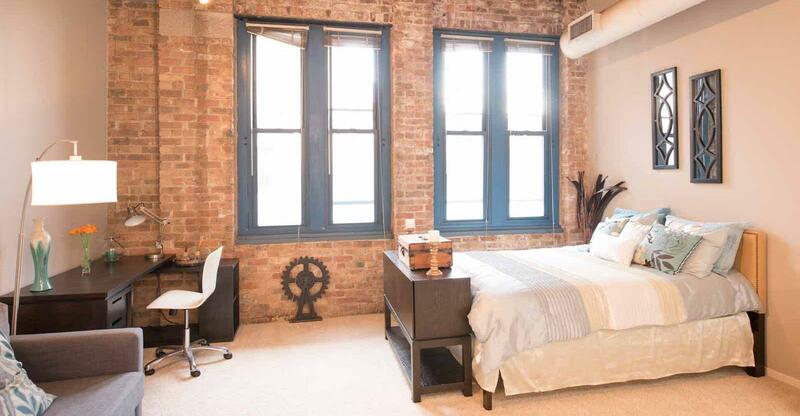 Perfectly situated in the heart of Chicago’s Old Town, Cobbler Square Lofts brings you the ideal blend of historical charm and modern convenience with a fresh take on mixed-use apartment living. Come home to comfort and efficiency with inspired design in every detail of our studio, one-, and two-bedroom homes with impeccable features and all of the elegant touches you deserve. Expansive kitchens flow seamlessly into spacious living areas and exhibit a variety of features including large islands, gas-range stoves, and more. Classic elements transform your space from an apartment to a home, and other important conveniences, like large closets, personal thermostats and central air, allow you to find a space that’s just right for you. Just steps from your home you will find a large selection of community amenities to bring luxury into your lifestyle. From Swerve Beauty Salon to Cafe Sushi, our mixed-use community boasts a variety of shops and dining to meet your every need. Our high-tech fitness center will get you moving and our tech-savvy business center is the perfect place to finish up that last minute presentation or just browse the web. Have it all at your doorstep. The Victorian-inspired atmosphere of Old Town Chicago is just a stone’s throw away from Cobbler Square Lofts, so our apartments make it so you don’t have to go far to enjoy the best shopping, dining, and entertainment our city has to offer. Influenced by the Yippies and Hippies of the 60s, Cobbler Square still offers eclectic shopping experiences, unique dining options, and a variety of local attractions you won’t find anywhere else. Find your dream home where history and modernity collide. Contact Cobbler Square Lofts today to schedule a guided community tour and begin the application process.